You can travel from western Europe to Georgia, Armenia or Azerbaijan, and once there you can use trains to travel safely and comfortably between these countries. If you have more information or photos that would be useful for this page, please e-mail me! Georgia, Armenia, Azerbaijan: GMT+4 all year, no daylight saving time. Georgia: No visa required for UK, US, Canadian and most EU citizens. Azerbaijan: Visa usually required, see https://evisa.gov.az/en or www.visaforazerbaijan.org.uk. Armenia: As of 2013, no visa is required for UK & EU citizens. Option 1 is to travel south of the Black Sea through Turkey into Georgia, and from there to Armenia or Azerbaijan. Option 2 is to travel north of the Black Sea, first travelling from western Europe to either Kiev or Moscow, then using the direct 3-times-a-week train from Moscow to Baku in Azerbaijan, or the once a week direct train from Kiev to Baku. There was a period when the Russia/Azerbaijan border was closed to westerners which rendered this option impractical, but I'm now getting occasional reports that westerners can indeed travel this way. The train passes through the republic of Dagestan, but according to one traveller (2018) "The train was staffed with security personnel, we never felt unsafe and enjoyed the open-minded and friendly behaviour and hospitality of our fellow (mostly Azeri) passengers." The same traveller reports, "There was no issue at all for us despite our German passports. No questioning at all nor any other problems. The border control went fast and smooth and our e-visas for Azerbaijan were accepted without hesitation". Step 1, London to Istanbul: Travel from London to Istanbul by train, as shown on the London to Turkey page. The journey takes 3 nights and departures are daily. 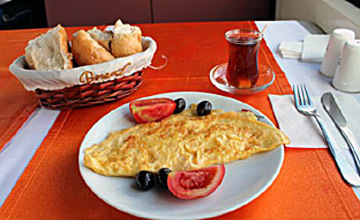 Spend at least 1 night in Istanbul. Step 2, Istanbul to Tbilisi (Georgia) by train and bus as shown in the section below. Journey 2 nights, 3 days to Batumi, 3 nights, 3 days to Tbilisi. Step 3, Tbilisi to Yerevan (Armenia) by train as shown here or Tbilisi to Baku (Azerbaijan) by train as shown here. Journey 1 night. Baku-Yerevan: There is no train service from Baku to Yerevan, but you can travel from Baku to Tbilisi and from Tbilisi to Yerevan. It's easy, cheap and comfortable, not to mention very scenic, to take a sleeper train right across Turkey from Istanbul or Ankara to Erzurum or Kars, then transfer by bus to the Georgian border at Sarp/Batumi for an onward train to Tbilisi. Although the border between Turkey and Armenia is closed, you can easily travel from Istanbul to Tbilisi, then take a train on to Yerevan in Armenia. There's also a train from Tbilisi to Baku in Azerbaijan. New new direct Turkey-Georgia-Azerbaijan train in 2019? A new railway is has been built (and in October 2017, formally inaugurated) between Kars and Tbilisi that will allow a direct Ankara - Tbilisi - Baku sleeper train to operate at some point. 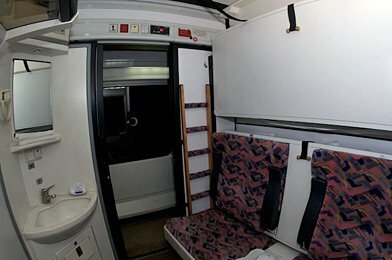 Swish air-conditioned sleeping-cars have already been built for the Azerbaijani Railways for this service, but there have been delays and delivery to Azerbaijani Railways isn't now due until March 2019, when testing can begin. I will update this page if and when the new service looks like actually starting, maybe now in mid-2019, but no sign yet. Step 1, travel from Istanbul to Ankara by YHT high-speed train as shown on the Train Travel in Turkey page. Step 2, travel from Ankara to Erzurum or Kars by sleeper train: Travel by train from Ankara to Erzurum or Kars, see the train times, fares & information here. For example, the Doğu Express leaves Ankara at 18:53 arriving Erzurum 16:53 and Kars 22:15 next day. The train is modern and air-conditioned with restaurant car, reclining seats and air-conditioned sleeping-cars with private 1 or 2 bed compartments with fridge to keep your beer cold... 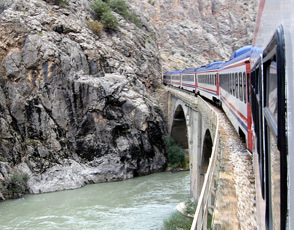 It's a spectacularly scenic journey right across Turkey, highly recommended. You can book the train online at the Turkish railways website, which accepts non-Turkish credit cards, see the advice on using www.tcdd.gov.tr here. Step 3, travel from Erzurum or Kars to Batumi by bus: Take a bus or dolmus (local minibus taxi) from Erzurum or Kars to the Georgian border at Sarp 275km from Erzurum, 283km from Kars, about 4h45), then another dolmus the 16 km from Sarp to Batumi, just the other side of the border. Step 4, travel from Batumi to Tbilisi by train: There are now two daytime electric trains on this route, leaving Batumi 07:30 and 17:55, arriving Tbilisi at 12:25 and 22:50 respectively. The fare is 46 Lari (about €16) in 1st class and around 20 Lari (€7) in 2nd class. These trains are now modern air-conditioned Stadler Kiss double-decker electric trains, see the photos below. You can check current times at the Georgian Railways website, www.railway.ge/?web=0&lang=eng, look for 'passenger operations' then 'Traffic schedule'. The station at Batumi used to be just outside the town at Makhindjauri, but in 2015 a new central station opened in Batumi itself, much closer to the centre. You can buy tickets at the station, or you can now book online in English within 40 days of departure at www.railway.ge/?web=0&lang=eng, so far I have received several confirmed reports of successful online purchases in English with UK & US credit cards. Alternatively, you can also book at private agency https://biletebi.ge which may easier, there's just a small booking fee of around 1.50 Lari. If you have feedback on travel via this route, please e-mail me. Step 5, for Yerevan (Armenia), take a train from Tbilisi to Yerevan, see the Tbilisi-Yerevan section below. 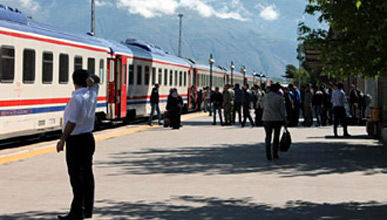 In fact, in summer (mid June to September) there's a direct train from Batumi. Step 5, for Baku (Azerbaijan), take a train from Tbilisi to Baku, see the Tbilisi-Baku section below. Step 1 starting in Yerevan (Armenia): Take a train from Yerevan to Tbilisi, see the Tbilisi-Yerevan section below. Step 1, starting in Baku (Azerbaijan), take a train from Baku to Tbilisi, see the Tbilisi-Baku section below. Step 2, travel from Tbilisi to Batumi by train: There are now two daytime electric trains on this route, leaving Tbilisi 08:00 and 17:35, arriving Batumi at 12:59 and 22:34 respectively. The fare is 46 Lari (€16) in 1st class and around 20 Lari (€7) in 2nd class. You can check current times at the Georgian Railways website, www.railway.ge/?web=0&lang=eng, look for 'passenger operations' then 'Traffic schedule'. You can buy tickets at the station, or you can now book online in English within 40 days of departure at www.railway.ge/?web=0&lang=eng, so far I have received several reports of successful online purchases in English with UK & US credit cards. Alternatively, you can also book at private agency https://biletebi.ge with small booking fee of around 1.50 Lari if you find that easier. If you have feedback on travel via this route, please e-mail me. Tip: There's a decent cafe serving good coffee and cooked breakfasts on the top floor of Tbilisi station. Note that the station at Batumi used to be just outside the town at Makhindjauri, but in 2015 a new central station has opened in Batumi itself, closer (2.5km) to the city centre. 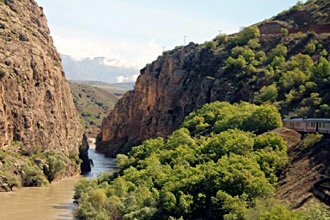 Step 3, travel from Batumi to Erzurum or Kars by bus: Take a dolmus the 16km from Batumi to Sarp, walk across the border, then take a Turkish bus or dolmus (local minibus taxi) from Sarp to Erzurum or Kars. Step 2, travel from Kars or Erzurum to Ankara by sleeper train, see the train times, fares & information here. For example, the Doğu Express leaves Kars at 07:45 and Erzurum at 12:26 arriving Ankara at 08:05 next day. The train is modern and air-conditioned with restaurant car, reclining seats and air-conditioned sleeping-cars with private 1 or 2 bed compartments with fridge to keep your beer cold... It's a spectacularly scenic journey right across Turkey, highly recommended. You can book the train online at the Turkish railways website, see the advice on using www.tcdd.gov.tr here. Step 1, travel from Ankara to Istanbul by YHT high-speed train as shown on the Train Travel in Turkey page. On board the sleeper from Ankara eastwards. 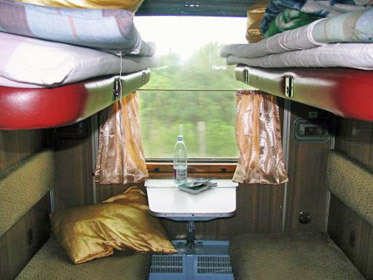 This is a sleeper compartment with seats folded out and beds folded away... Courtesy of Shigeki Murao. Great scenery on the train to Kars: Two views from the Dogu Express, alongside the Euphrates river between Sivan & Erzurum. Away from road development, you'll see great scenery from the comfort of your train. It's the inexpensive & relaxed alternative to airport stress or a nightmare journey in a cramped bus. Photos courtesy of Conor Meleady. More scenery from the Dogu Express... Photos courtesy of Maximilian Meyer. An omelette and tea in the dining car... Photos courtesy of Maximilian Meyer. Breathtaking - the Dogu Express in eastern Turkey. Courtesy of Matthew Woodward, read his blog about the journey here. Batumi's new (and largely deserted) central station. Courtesy of Krzysztof Sokol. The train between Batumi Central & Tbilisi, seen at Tbilisi main station. These two daily trains in each direction are now smart double-deck Stadler Kiss electric trains like these, clean, modern and air-conditioned. Courtesy of Peter Deegan. Scenery from the train from Batumi to Tbilisi. Courtesy of Peter Deegan. Traveller Emily Shirley travelled to Tbilisi: "There are several hotels in Erzurum. The posh Guzelyurt restaurant appears to be the only one serving wine and other alcoholic drinks. There is a blues night club down the hill serving beer which has live bands. To get to the border with Georgia, you need to locate the office of Artvin bus company. They have buses every 3 hours or so to Hopa. The coaches are modern and comfortable with free drinking water distributed in small cartons and handwash liquid. The stop for lunch/supper can be brief so be alert about grabbing your grub in the cafe a.s.a.p. Coach departures are announced through a speaker in the tree. 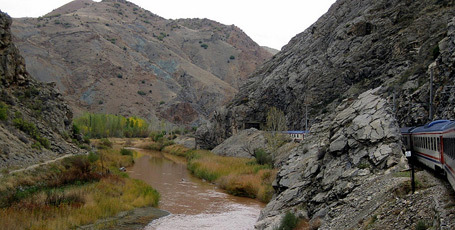 The bus passes through a series of deep gorges where blasting is going on for the new railway to Baku. Once you are dropped at a junction in Hopa, you need to find your way to the border, 15kms away. Cadge a lift, take a taxi or if you have a folding bike with you: cycle there. It is completely flat along the shore of the Black Sea. You will find a warm welcome to Georgia on the border if you are European or American. On the other side there are taxis and buses and ATMS to get you to Batumi about 23 kms away. Few people speak English so knowledge of a Slav language can be helpful even though their own language is not Slav. Most people to admit to understanding Russian even though the Red Army has invaded South Ossetia and Abkhezia. 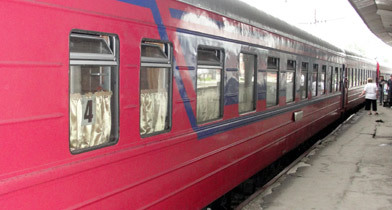 Georgian Railways run a puntual comfortable service from Batumi to Tbilisi. It is advisable to take this rather than the dangerous " Mashrutkas" minibuses often 40 years old with bald tyres. You are risking your life in such death traps. From Batumi there is also a train to Yerevan, Armenia which stops at Tbilisi. In typically glitzy Armenian style the curtains are gold satin. 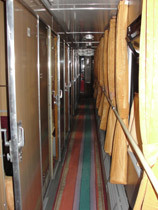 Sleeper cabins are cheap, colourful and comfortable. Tbilisi station is modern with many shops and fast food restaurants. Traveller Gregory Heilers travelled to Tbilisi: "(1) From Erzurum, take the Artvin Express mini bus, which runs twice daily at 07:30 & 18:00 taking 5.5 hours from Gurcu Kapi district of Erzurum to Hopa (via Artvin, hence the name). Fare 30 TL. (2) Travel from Hopa to Sarp by dolmus - you can get dropped off there which the driver did for me after the mini-bus attendant understood I was headed to Georgia (Gurcistan in Turkish). Cost 3.5 TL. (3) In Sarp, walk across the border- there was a line 2km long of vehicles waiting to cross that included the buses from Turkish cities to Batumi/Tbilisi and beyond... I was glad to have not taken a direct bus. (4) Take a Georgian dolmus (marshutka) from the frontier to Batumi, cost 1 lari. Pretty much the only direction you can go as I saw, so even if you can't understand the writing or language- may as well try. (5) Travel from Batumi to Tbilisi train, fare 40 lari. It departs 22:30 and arrives Tblisi 06:45." If you have any more feedback on this or any other route, please e-mail me. From late September to mid-June, the Tbilisi-Yerevan train (train 371) runs every second day, leaving Tbilisi at 20:20 and arriving Yerevan at 07:50 next day. The train reaches the Armenian border around 23:00. Double-check times & days locally. It runs on odd-numbered dates (3rd, 5th, 7th & so on), but won't run on 1st of the month following a 31st of the previous month. If you need a visa, visas can be bought for US$6, no change is given so have the exact money, can be paid in Armenian or Georgian currency. From mid-June to late September, train 201 runs daily and starts in Batumi leaving at 15:35 and Tbilisi at 22:16 arriving Yerevan at 07:25. See www.ukzhd.am (click the UK flag, then look for passenger transportations then schedule). Check exact times locally. It has 1st class spalny vagon 2-berth sleepers, 2nd class kupé 4-berth sleepers, 3rd class platskartny open plan sleepers. The fare is around 115 laris in 1st class sleeper, 85 laris in a 2nd class sleeper, or 66 laris in a 3rd class sleeper (3rd class fare confirmed, 1st & 2nd class are estimated). At time of writing, £1 = 3.45 laris, €1 = 3.02 laris. Buy tickets at the station, from the helpful English-speaking lady at counter 14 (or window 2, as more recently reported) at Tbilisi's main station. You can check times at the Georgian railways website www.railway.ge/?web=0&lang=eng, click 'Passenger operations' then 'Traffic schedule' then 'International trains'. From late September to mid-June, train number 372 leaves Yerevan at 21:30 every second day, arriving Tbilisi at 07:50 next morning. It runs on even-numbered dates (2nd, 4th, 6th and so on). Double-check times & days locally. From mid-June to late September, train 202 runs daily, leaving Yerevan at 15:30 and arriving Tbilisi at 00:12 (just past midnight) and Makhindjauri (Batumi) at 07:10. The train has 1st class spalny vagon 2-berth sleepers, 2nd class kupé 4-berth sleepers, 3rd class platskartny open plan sleepers. See www.ukzhd.am (click the UK flag, then look for passenger transportations then schedule). Check times locally, as times may vary - a display board at Yerevan station shows times, prices and berth availability each day for the next month. The fare is 22,200 Armenian drams in 1st class sleeper, 18,480 Armenian drams in a 2nd class sleeper, 12,480 drams in a 3rd class sleeper. At time of writing, £1 = 630 Armenian dram, €1 = 550 Armenian dram. Buy tickets at the station. Staff at the station don't speak English, though there may be someone able to translate or try writing down what you want. However, apart from this buying a ticket is quick and efficient . The ticket office is on the left hand side near the platforms. There's an ATM outside the ticket office to get out cash. 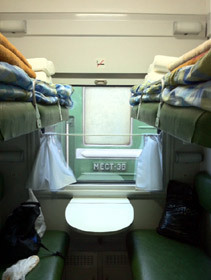 Above: Inside the sleeper train from Tbilisi to Yerevan in Armenia, with 4-berth & 2-berth compartments. Corridor photo courtesy John Samuelson. 4-berth photo courtesy of Paul Carey. 2-berth photo courtesy of Eugene Maguire. Traveller Zaki went from Yerevan to Batumi in 2018: "Tickets for the train should definitely be bought in advance in Yerevan. Yerevan Station is two metro stops from Republic Square in the centre of Yerevan, and the round trip can easily be done in 45 minutes. Just before the train left, there were quite big queues at the ticket window and it looked like some people weren't able to buy tickets. My first class "spalny vagon" was 26,000 AMD to Batumi (about £40). As others have said, the compartment is very comfortable but dated. The only things provided are bottles of water and some sweets; there's no supermarket near Yerevan station so buy food and drinks in the city centre. There is nothing to do on the train other than sit or lie on your bed, which is relaxing if you're sharing with someone you know or have a cabin to yourself, but might be awkward if you don't speak the same language as the person you're sharing with. 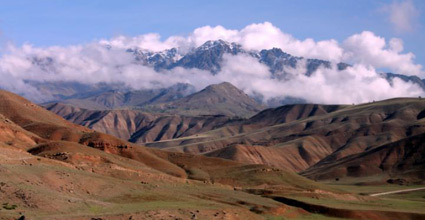 The views of the Armenian countryside are stunning. The border crossing happens about 10pm. On the Armenian side the train stops whilst their officials come through the train with a laptop, but the Georgians board the train, collect passports and then ride the train to another station where they seem to have an office. This is slightly alarming if you're half asleep although the carriage attendant makes sure everyone has their passport back. However the border guards in both countries were friendly and helpful." Traveller Lauri Hallila reports from a Tbilisi-Yerevan journey in 2017: "We booked our tickets one and half days before departure; there were no places for spalny vagon left, so we bought tickets for kupé for about 63 laris per person. The woman at the counter spoke good English; she asked for our passports, but our names written in Cyrillic in our tickets still ended up a bit wrong. However, it didn't cause any problems. The train leaves at 20:20 and is supposed to arrive the next day at 6:55, though we were five minutes early. We shared our compartment with two Americans and had great time with them. When the officials at the Armenian side noticed from our passports that we've been to Azerbaijan, they asked us the reason for our travelling (tourism), required to see which hotel we had booked in Yerevan and called there to confirm that we indeed had booked that hotel. In this train, there was no option to buy tea of coffee in the morning as in Baku-Tbilisi train." Traveller André Devecseri reports from a Yerevan to Tbilisi journey in 2017: "At Yerevan station I was offered a choice between a platzkart [open-plan bunks] upper bunk for AMD 8480, platzkart lower bunk for AMD 9580, kupé [4-berth] upper bunk for AMD 12910, kupé lower bunk for 14050, and SV [2-berth] for 17860. I went with a kupé lower bunk, with AMD 12910= £20 or €24. I had to present my passport for the passport number to be put on the ticket. An hour before departure I was able to board the train. On the table was a bottle of water, and the look of the interior, not least the curtains, was as excessively splurge as on many other Soviet trains. The train left at 21:30 sharp, shortly after which the conductor came inside to check my ticket and passport. The onboard staff is Armenian and spoke Armenian and Russian, but no English save for a few words such as "ticket". The conductor was kind enough, to let me use the lwoer berth despite having bought an upper one for less, as there was no one else in my compartment (and wouldn't be for the whole trip). The train drifted through the stunning Armenian countryside at a comfortable pace, however I didn't get to see much as I fell asleep within just an hour on the very comfortable mattress that was prepared for me in the compartment. At 03:50 I was woken up at the Armenian border at Ayrum as an Armenian border guard opened the door and I was asked for my passport. Being Swedish, I get to stay without a visa for 6 months and I had stayed for 5 days, so after a 20-second inspection I was stamped out, and quickly fell asleep again. I was woken up again about an hour later at Sadakhlo, this time by the Georgian police. I sleepily handed him my identity card, and after some brief bickering about the fact that I didn't need a passport (I denied having one, in order to avoid more stamps than necessary), he took it away for scanning and woke me up another hour later handing it back. Almost immediately thereafter, the train was on its way. The train arrived in Tbilisi at 08:00, 10 minutes late. All-in-all, a comfortable journey and a good night's sleep." 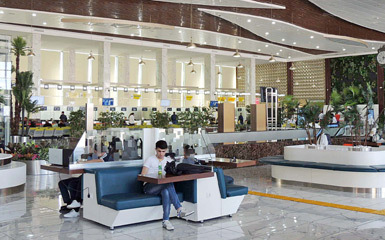 Traveller Billy Hicks travelled Yerevan-Tbilisi in 2016: "Yerevan railway station now has an extremely useful digital display screen showing full times and prices for every Yerevan-Tbilisi train for the next month as well as the number of beds remaining in all three classes for each train. I purchased the lowest-priced third class sleeper (AMD 9,200) in English without any language difficulties, there is an ATM right outside the ticket office to acquire the cash. Being a weekday in November the train was half empty and I was easily able to buy my ticket a few hours before departure. Third class is essentially a hostel on wheels, 54 beds in the carriage with the upper bunks being slightly cheaper than the lower bunks. A great option if you're cash-strapped like me and feeling social as you meet plenty of people from everywhere in the world, and conversation was plenty throughout for the few of us in the carriage while still being quiet enough to able to sleep when needed. Passport control on both borders went with no problems, no visas or forms required for British citizens for either country. A great journey and two wonderful cities!" Traveller John Walker reports (September 2016): "A wonderful journey. This journey is worth it just for the sunrise view of Mount Ararat that you may be lucky enough to witness as the train approaches Yerevan. We booked our tickets at the friendly and helpful counter service in Tbilisi Central station. We could not pay for the tickets by card...cash only for international ticket purchases. 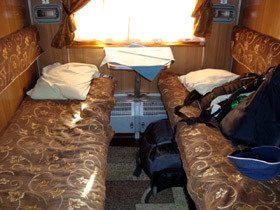 The price was 56 Lari (£18) for a bed in a 2nd class, 4 berth cabin. On-board, the female carriage attendant was stern and obviously took pride in her work, she was also very helpful and spoke reasonable English. Sheets, pillows and a towel are provided, all are clean and comfortable. Tip: If you want to turn the cabin music off, the volume dial is hidden behind the curtain! Visa procedures were swift and amiable (we were two UK nationals travelling). As previously mentioned, the view of Ararat is spectacular as it is bathed in sunrise light- a wonderful sight to wake up to and a most fitting prelude to arrival in the Armenian capital." Traveller Alexander Bainbridge reports (2015): "We bought our tickets at Tbilisi's central railway station (now essentially a shopping centre). The ticket office is on the 2nd floor. English-speaking employees are there to direct travellers towards the right window. 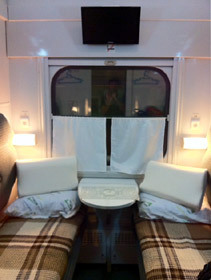 We paid GEL 104 (£29) per first-class "spalny vagon" (SV) berth going to Yerevan, and AMD 20,750 (£29) for the return. Children travel half-price. Passports are essential for booking, and great care must be taken when the names are transcribed into Russian: a serious mistake could be fatal at the border and lead to much hassle. The train leaves Tbilisi at 22:16, arriving in Yerevan at 07:00; return trip 15:30-00:15. 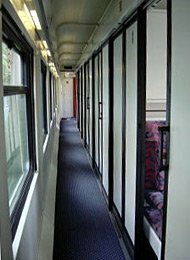 The carriages seem to have been refurbished a couple of years ago but remain very soviet-era, and the voluminous plastic curtains in every compartment are absolutely hideous. Pop music is piped through over speakers in the corridor most of the time, but the volume is kept blissfully low. Only the upper sections of a few windows in the corridor can be opened, but the air conditioning does actually work. The loo and bed linen are basic but quite clean, all things considered. The carriage's attendant - a ruthless, unsmiling Armenian woman who doesn't speak a word of anything besides Armenian and Russian - runs her carriage with an iron fist: passengers are an inconvenience to be dealt with. Almost all the passengers in first class are foreign tourists. The only perk is a small half-litre bottle of water, so bringing even the most basic supplies for the journey is absolutely essential. The border is a formality, and takes around an hour. The Armenian border guards at Sadakhlo/Ayrumi have portable computers capable of scanning passports in situ; the Georgian ones collect all the passports and return them a short while later. Passengers needing an Armenian visa at the border must leave the (guarded) train and pay a fee in a small low building by the platform, which is rather mysteriously named (in Russian) "Centre for the effective use of technology and aesthetics" (sic). The return journey is largely in daylight with some amazing (if bleak) views of Armenia. Yerevan railway station has a fun little railway museum, open daily from 10:00 to 18:00. A taxi from Yerevan railway station to the centre should not cost more than AMD 1,000-1,500; in Tbilisi no more than GEL 5-10. Beware the drivers at the station, it's probably best to ignore them and to strike out for taxis on the main avenue." 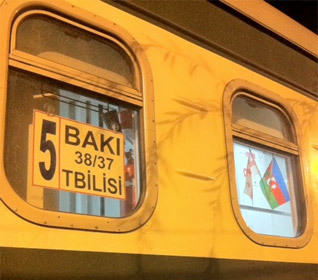 There's an overnight train from Tbilisi to Baku in Azerbaijan every night. Train 37 leaves Tbilisi daily around 20:35 arriving Baku at 08:50 next morning. The train has 1st class spalny vagon 2-bed sleepers, 2nd class kupé 4-berth sleepers and 3rd class platskartny open-plan sleepers. Buy a ticket at the station. The fare is around 84 laris in a 1st class sleeper, 52 laris in a 2nd class sleeper 35 laris in a 3rd class sleeper. You can check times at www.railway.ge - change language to English and click Passenger operations. The distance is 551km. Train 38 leaves Baku every day at 20:40 arriving Tbilisi at 08:55. The train has 1st class spalny vagon (SV) 2-bed sleepers, 2nd class kupé 4-berth sleepers, 3rd class platskartny open-plan sleepers. The distance is 551km. The fare is 57 Manat in a 1st class sleeper, 33 Manat in a 2nd class sleeper or 23 in a 3rd class sleeper. At time of writing, £1 = 2.22 manat, €1 = 1.94 manat. You can easily buy a ticket from Baku to Tbilisi at https://ticket.ady.az - select English top right and book from Baku-Pass to Tbilisi-Pass. 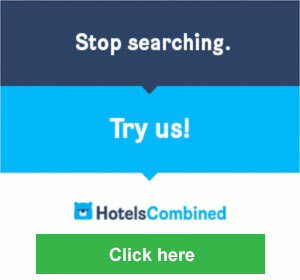 You can book a maximum of 10 days in advance. You pay with MasterCard, Visa or Maestro. You get a booking reference which you need to collect tickets at Baku station, you can show this reference number on your smartphone if you can't print it out. Tickets must be collected at least 1 hour before departure from the ticket counters on the lower level - follow the signs to kassalar. A queuing system operates at the ticket office, so take a numbered ticket (press online bilety) and wait for your turn. Bring your passport. You can easily buy at the station, but remember that your passport will be required. 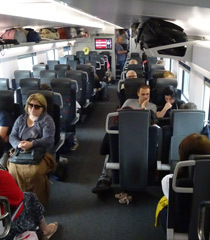 If there are no sleepers left, don't worry, buy a seats ticket and you may be able to upgrade on the train. A visa usually required for Azerbaijan, see https://evisa.gov.az/en or www.visaforazerbaijan.org.uk. Traveller Alistair Campbell reports from a Tbilisi to Baku train journey in 2017: "We bought our tickets on the top floor of the Tbilisi railway station / shopping centre. International tickets are only sold from the left side windows and you need to get a numbered ticket which gets you into the queue. No queue when we were there but you still have to get a ticket and then get directed to a window. We wanted to travel in the 1st class sleeper at a cost of 84.86 laris each and the lady in the office understood this, even though she had little English. You can check that you have bought the right class as the ticket class is on the ticket she gives you. 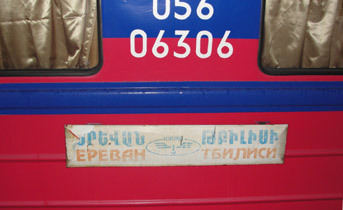 This shows CB(....) for 1st class (CB is Cyrillic for SV, short for "Spalny Vagon"). They only take cash, no cards. Platform entry is from the 1st floor of the shopping centre and the sign telling you which platform your train is on can be found over the ticket office on the top floor. There is also similar information on the platforms. The train was in the platform being prepared when we arrived an hour before departure at 19:30. We were allowed on about 30 minutes before departure. 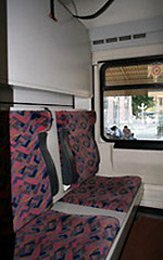 The compartment for two was clean, reasonably well lit and comfortable. We were given clean bedding as we left Tbilisi at no charge by the lady carriage manager, who spoke enough English for us to get by. She also provided us with some clean glasses so that we could drink the wine we had brought. There is no food or drink on the train but there was a constant supply of boiling water available from an urn at the end of the corridor. The manager did bring us a tray of black tea and sweets for breakfast. The ride was pretty good and we slept well. The border was pretty easy. We did not leave our compartment to leave Georgia, just handed our passports in, together with our Azerbaijan e-visa paperwork. Eventually, all was returned and we headed across no-man's-land. The Azerbaijan border took longer. We were summoned, one-by-one, to the end of the carriage to be questioned and photographed. Then a dog and a man with a mirror on a pole looked around out compartment and chatted about football. And that was it. It did overrun by about 30 minutes and we eventually arrived into Baku the following morning 90 minutes late. Here, again, the station is embedded in a shopping centre. If you need money, there is an ATM on the floor below the platforms. This floor leads out onto a square where there are taxis, 5 ANZ should get you anywhere." Traveller Lauri Hallila reports from a Baku to Tbilisi journey in 2017: "We tried to book our tickets online at biletonline.ady.az, but didn't succeed. After registering, you can still check there how many places are left in different classes. We had a local helping us to buy the tickets at the station one and half days before our journey; there were only two places left in spalny vagon in different compartments, so we bought tickets for kupé for little over 33 manats per person. We were told to pay the tickets at a different counter from where we originally went. They didn't speak English downstairs where we bought our tickets; we later noticed that the counter 22 mentioned in another report where they might speak English was upstairs. The train leaves at 21:10 and is supposed to arrive the next morning at 10:40, though we arrived ten minutes earlier. Train arrives close to border at around 7, but border formalities take about 3 hours, one & a half hours on each side of the border. An old Azeri woman and her granddaughter shared our compartment for part of the way; luckily, they both spoke good English and were enjoyable company. We could buy some tea or coffee in the morning for 1 manat per cup in the morning." Traveller Ann Woodward reports from a Tbilisi to Baku train journey in 2017: "I took the overnight train from Tbilisi to Baku on Sunday night. I paid 84 lari for my ticket (~$34 US dollars), as did the couple in the cabin next to me. We'd purchased tickets in Tbilisi one week+ ahead, so not sure if that had anything to do with the pricing. Some of the people who sell tickets at the station in Tbilisi speak English, but if you get someone who doesn't, they'll direct you to someone who can. We left exactly on time. Arrived at the Georgia border 8:30pm, were done by 9:30pm. Progressed a bit further down the tracks to the Azerbaijan border. That entry process was complete by 11pm. We arrived in Baku basically on time, perhaps 10 minutes late. Passengers should be aware that there's no food or drink on sale on the train. There was a machine with hot water, but you need to bring your own mug, tea/coffee, sugar, etc.. It was a pleasant experience & I'm glad I took the train instead of flying." 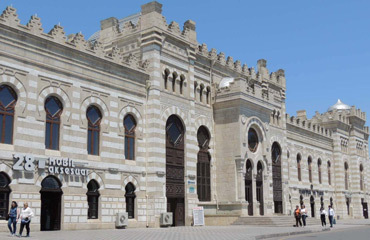 A modern station building - comparable to a shopping mall - has now been built adjacent to Baku's historic original station. There is an ATM in the level below the platforms. There are plenty of taxis on the forecourt. Photos below courtesy of Frank Pawlowski.